Welcome to Casa Esmeralda. Our beautiful new seven bedroom/six bathroom home is situated in exclusive Emerald Island, a new gated resort community which is within 5 minutes’ drive of Disney World. We also provide free high speed wi-fi internet access throughout the house and free long distance and international phone calls. Relax in spacious luxury inside or out. Each bedroom has a TV/DVD combo. The main family area has a 52 inch wide screen “smart” TV with a soundbar and Blu-ray DVD player. The second floor den has a flat screen TV with PS2 (with a selection of games). The kitchen is generously equipped for eating indoors or outside. The house is fully air-conditioned and has a games room with a pool table and foosball table. The house leads onto a shaded lanai with tables and chairs. Beyond is a screened deck area with a heated south facing 30 foot pool and spa with sun loungers, overlooking a lake and a wooded conservation area. There are alarms on all doors leading to the pool and a child safety fence can be erected if preferred. Emerald Island (considered one of the area’s finest communities) is built around a wooded area with a walking/jogging/biking trail. Shuttle services are available to the attractions. There is a large clubhouse with a heated community pool and spa, sauna, fitness centre, clubroom, video games room and computer room with internet access. Facilities also include an outdoor play area for children, tennis courts and a Tikki Hut. The management company for our house is based two minutes’ drive away in Formosa Gardens Plaza which has a large supermarket and several shops and restaurants. For sports enthusiasts, there are several highly regarded golf courses within a very short drive. 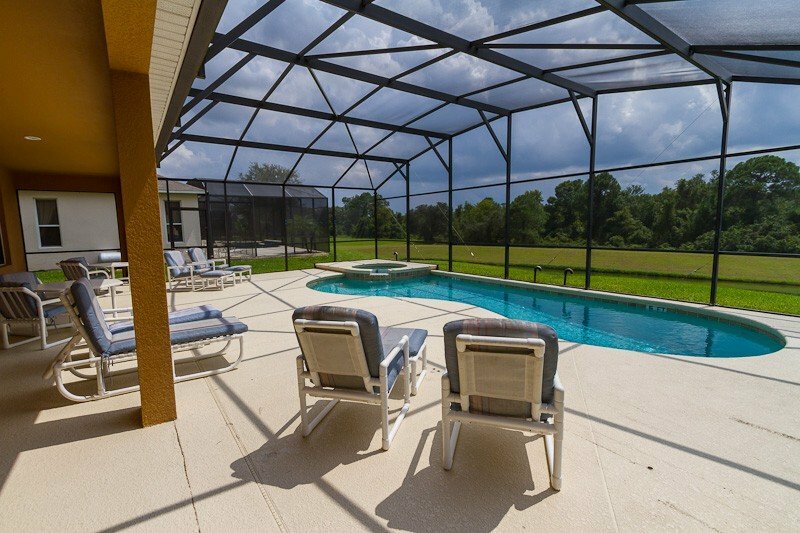 In addition to Disney World, attractions such as Sea World, Universal Studios and Islands of Adventure are easily accessed via the I-4 junction minutes away from the house. Kennedy Space Centre is an hour’s drive away on the Atlantic Coast along with famous beaches such as Cocoa Beach. Busch Gardens in Tampa is an hour’s drive towards the Gulf coast with yet more beautiful beaches to choose from along the Gulf. South facing pool area overlooking lake and conservation woodland.